She’s touring Australia this month and we can’t get enough of her music, but is there a maths factor to the nation’s Pink passion? Maths definitely plays a role, according to Associate Professor Julie Rowlett who will deliver the 2018 Australian Mathematical Sciences Institute (AMSI) Winter School public lecture from 6pm at the University of Queensland (UQ) on 9 July. This maths factor, says the Chalmers Institute of Technology Mathematician and sometimes singer, is down to a group of numbers known as eigenvalues or the spectrum. “Relatives of pi, these mysterious numbers are responsible for how the music we love sounds. 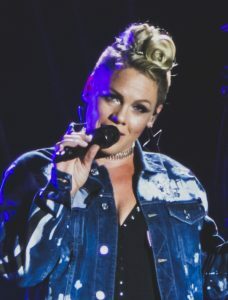 They are responsible not only for the sounds made by string instruments like guitar and piano, but also for the unique sound of Pink’s voice,” says Associate Professor Rowlett. Calculations using these numbers help explain a range of phenomena such as how waves travel, the flow of heat and the energy of quantum particles. In music, says Rowlett, they allow us to tell the ‘real story’ behind vibrating frequencies and sounds. “Understanding these vibrations and how they can be used provides insights into how we make music and why we like it. For example, why a rock guitarist who wants to play high notes holds the strings way down close to the base of the guitar,” she says. Originally from the US but now based in Sweden, Rowlett is also one of four field specialists leading short courses for Australia’s brightest mathematics postgraduates and early career researchers during the 2018 AMSI Winter School on Curvature. One of a series of public events run during AMSI’s annual flagship programs, AMSI Director Professor Geoff Prince, says lectures such as Rowlett’s help rewrite the public narrative surrounding maths. “Julie Rowlett’s lecture offers the public a powerful opportunity to engage with mathematics and its value in deepening understanding of the world,” says Professor Prince. AMSI Winter School 2018 is hosted by UQ. A popular destination for postgraduate students, postdoctoral fellows and early career researchers in the mathematical sciences, the two-week residential event expands learning to deepen field knowledge and help build collaborative networks. UQ Maths Lecturer and 2018 AMSI Winter School Director, Dr Phillip Isaac, said the event was an exciting opportunity to foster Australia’s mathematical capability. AMSI Winter School 2018 is sponsored by AMSI, the Department of Education and Training, UQ, the BHP Billiton Foundation, ACEMS, QCIF and the Simulation Group. For more information visit https://ws.amsi.org.au.